Sam Allardyce’s last kick as a Sunderland player came during a victory at Anfield. On the final day of the 1980-81 campaign, Sunderland had to vanquish the then Liverpool behemoth on their own turf, if they were to remain in the First Division. In a familiar tale of Sunderland dramatically escaping the drop, the Black Cats beat the odds to triumph on Merseyside, with Allardyce – who was to join Millwall at the end of the season – entering the fray as an 87th minute substitute. “Stan Cummins scored and we were all surprised we had won!” said the current Sunderland manager. “We’d played Brighton at home the Saturday before and only needed a draw to be safe, but they beat us 2-1. “Brighton were down there with us, so, from needing a draw with two games to go, we needed a win at Anfield to stay up. The victory sparked wild celebrations in the away dressing room, with then Liverpool manager Bob Paisley personally bringing in a crate of beer to congratulate Sunderland’s players. 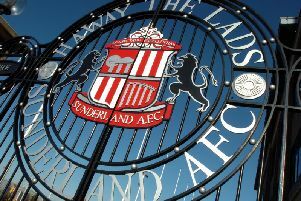 But Sunderland have only won once at Anfield since then – a 1-0 success two years later courtesy of a Gary Rowell penalty. If there is a time to end that Liverpool hoodoo, then Allardyce couldn’t pick a more opportune moment then tomorrow’s encounter, with Sunderland desperate to take a chunk out of the four-point deficit to safety. Liverpool are not impregnable, with Jurgen Klopp’s side conceding 12 goals in the five Premier League games since they triumphed at the Stadium of Light in December. No top-flight outfit can boast a worse record than the eight goals Liverpool have shipped from corners either. But after seeing Sunderland fail to take advantage of an excellent performance in Tuesday night’s defeat to Manchester City, Allardyce admits he’s concerned about his side’s ability to put the ball in the net when it matters. “Our greatest failing on Tuesday was the quality of our finishing,” said Allardyce. “It wasn’t good enough on some occasions and when it was, there was an England goalkeeper (Joe Hart) that pulled off two miraculous saves. “I know I strive for clean sheets, but Manchester City only had three attempts on target and that shows you how well we played defensively, first and foremost. “But, from an attacking point of view, not scoring was a crime on what we created. “It is a worry because the goals don’t come at the right time for us. “We had more chances than Manchester City, by far, but we haven’t scored one. “It is a concern and it’s not just Jermain Defoe’s responsibility. “It could be a defender off a set piece, and we’ve got to take advantage of that. “Conversion of chances is the difference between being at the bottom of the league, than the top of the league. Allardyce knows that Sunderland need to replicate the City display if they are to stand any hope tomorrow though, particularly as Liverpool could have the influential Philippe Coutinho returning from injury. “We’ve got to maintain the level of performance from the Manchester City game to get a result against Liverpool,” he added. “A lot of their injured players are coming back to fitness and will be eager to come into the side. “That’s maybe something which makes it more difficult for us.